The CM WordPress File Download Manager plugin creates a secure file sharing directory to easily upload, download, and share text files, videos, and images. Protect files with unique passwords, restrict file access by user or user group, charge for downloads via EDD or a virtual wallet, and much more! Get all the tools you need to build an online course, community database, or HR dashboard with this powerful plugin. The CM WordPress File Manager Plugin is a superb solution to build a file sharing directory similar to Google Drive or Dropbox on your WordPress site. 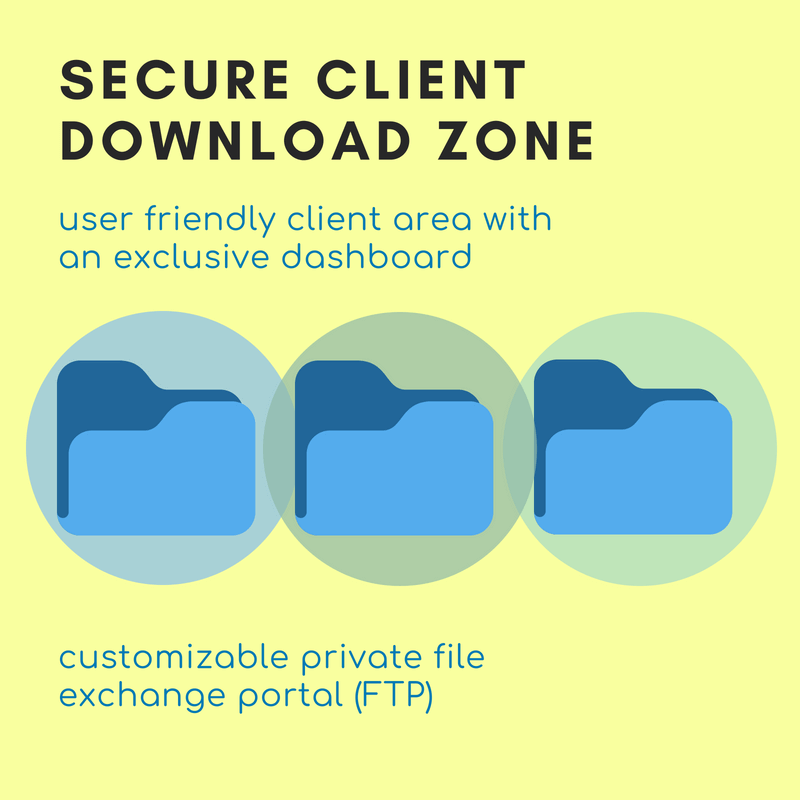 Securely upload different file types, give file access based on user permissions, create payment plans to access file downloads, and much more! Create a file sharing directory where users can upload and download files to and from your site. 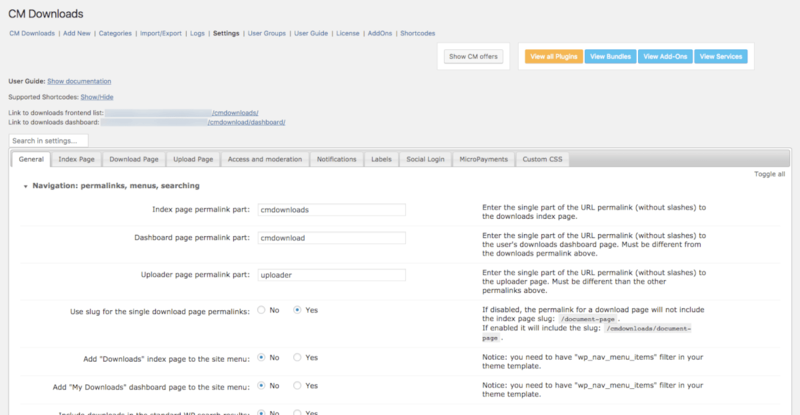 Every file uploaded will create a unique landing page with single file preview, support forum, download links and the ability to monitor the file's download activity. 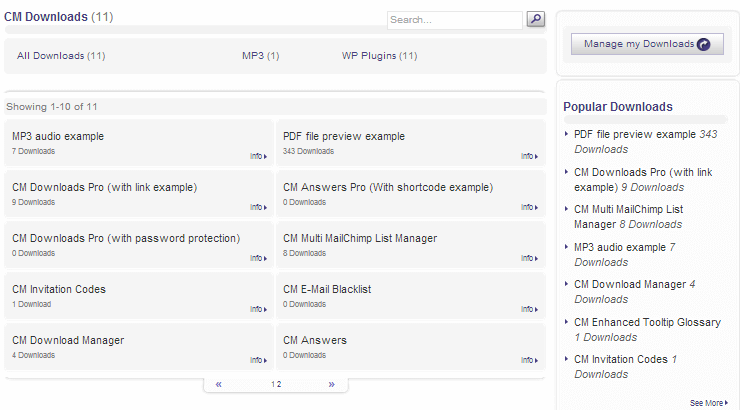 The plugin creates an index page listing all downloads by category, allowing multi level browsing and easy filtering by topic. 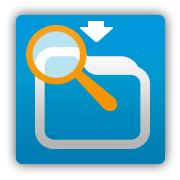 File downloads can be located by searching by keyword or tag, letting your users quickly find what they need. 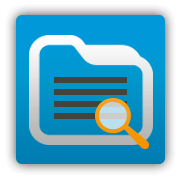 Users can search files, preview and download files, compressing multiple files associated with one download into a zip file. 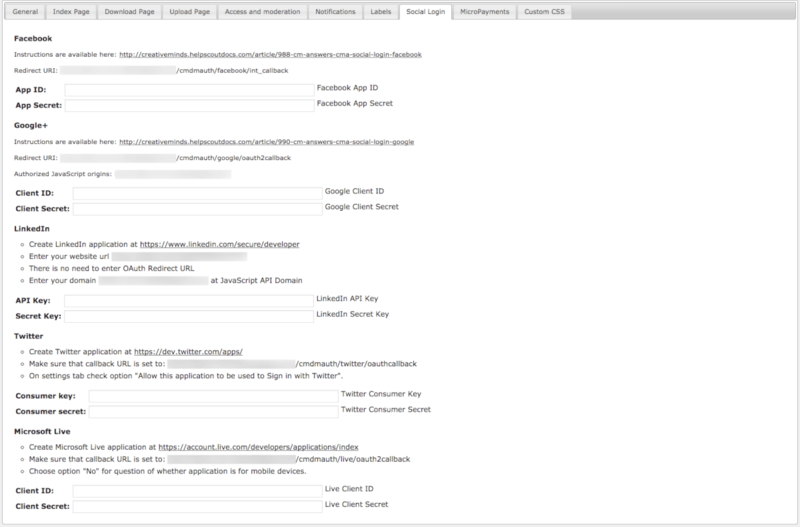 Embed prefiltered download lists, user dashboards, and more using shortcodes on any post or page. 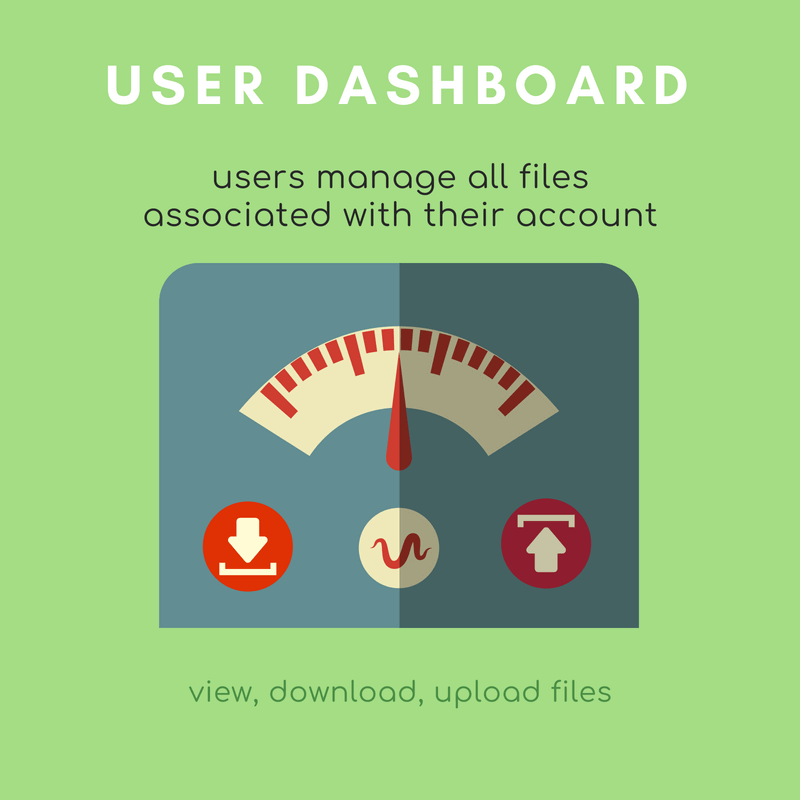 Each user receives their own user dashboard, from which they can manage their own downloads. This unique panel displays user downloads ID number, titles, status (either published or pending approval) and download count. 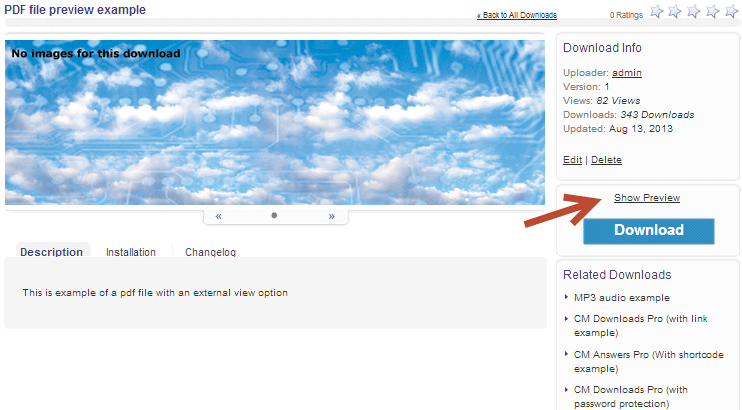 It’s also easy to publish and unpublish each uploaded file. Users can register and login with their Facebook, Google+, LinkedIn, and Twitter accounts. Fully integrated with BuddyPress, users can display their BP profile information alongside download stats. 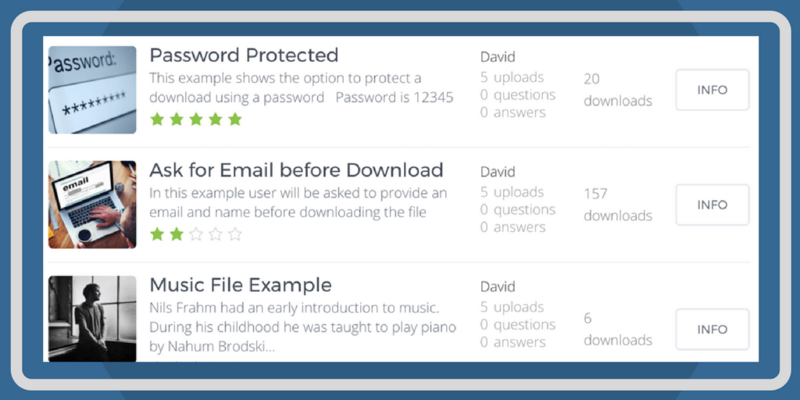 All downloads can be password protected or made accessible to specific user groups, letting you easily control who has access to which files. 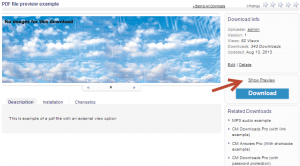 Choose whether to require users to enter their name and email before downloading a file. This lets you easily track which users download which file, and can also be used to quickly grow your email list. 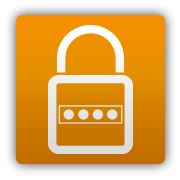 Thanks to a highly detailed access permissions infrastructure, the document management plugin lets you choose whether a file will be password protected, restricted to specific users, or user groups. 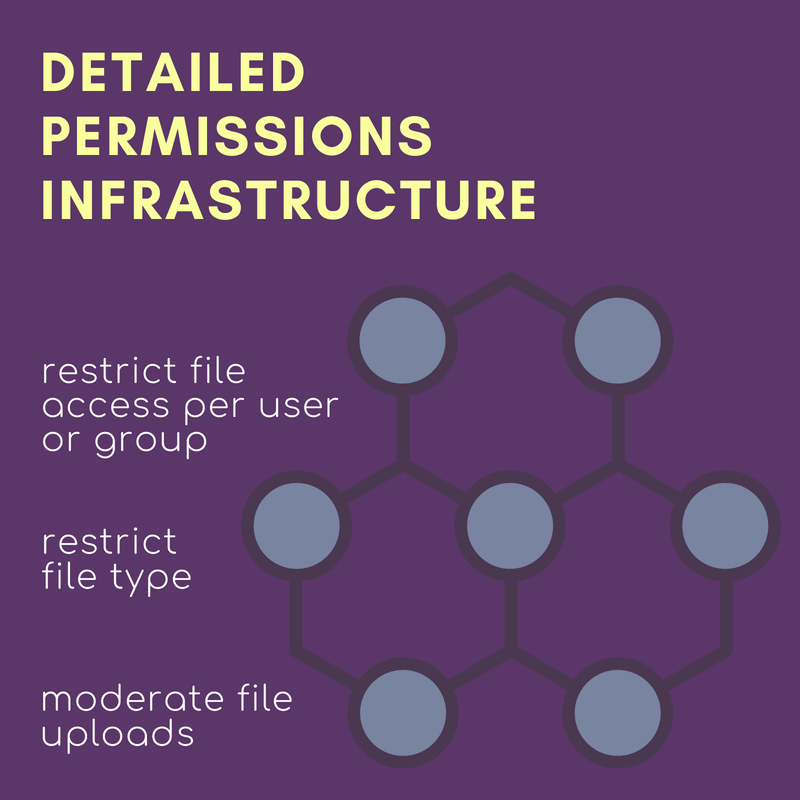 File Sharing Access Restrictions – The site admin can manage member access permissions, moderate uploads, and restrict permitted file types to make sure your online library stays free of spam. 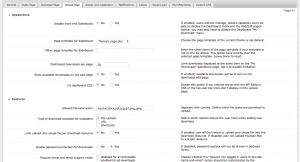 Single User Access – Restrict access of specific files to a single user. With this setting, users can see their own files uploaded and those shared by the admin, but not the files of other users. 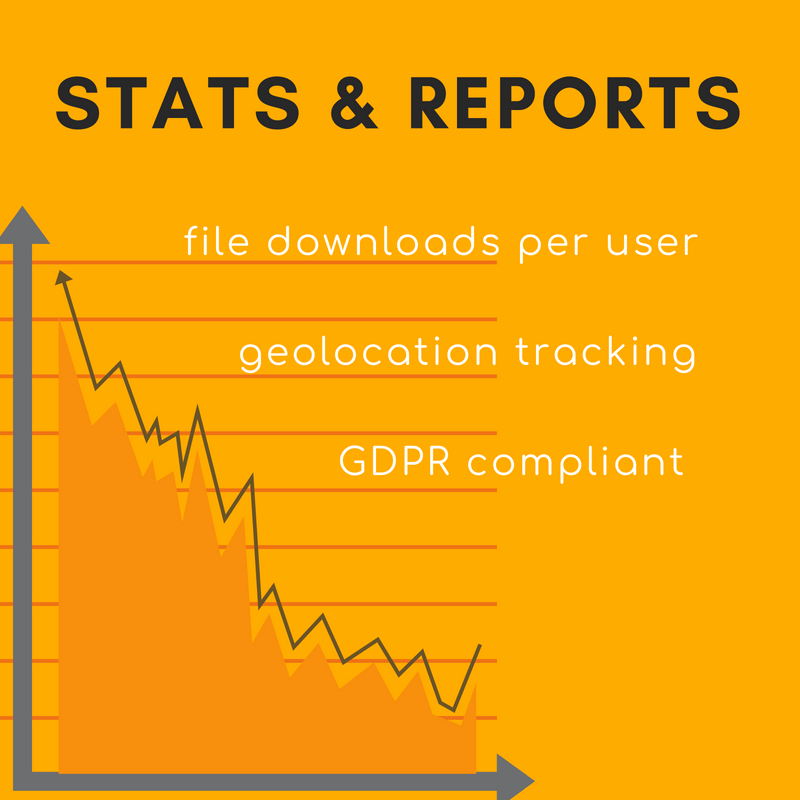 Track which users download which files using a detailed download log system, complete with geolocation data and much more. 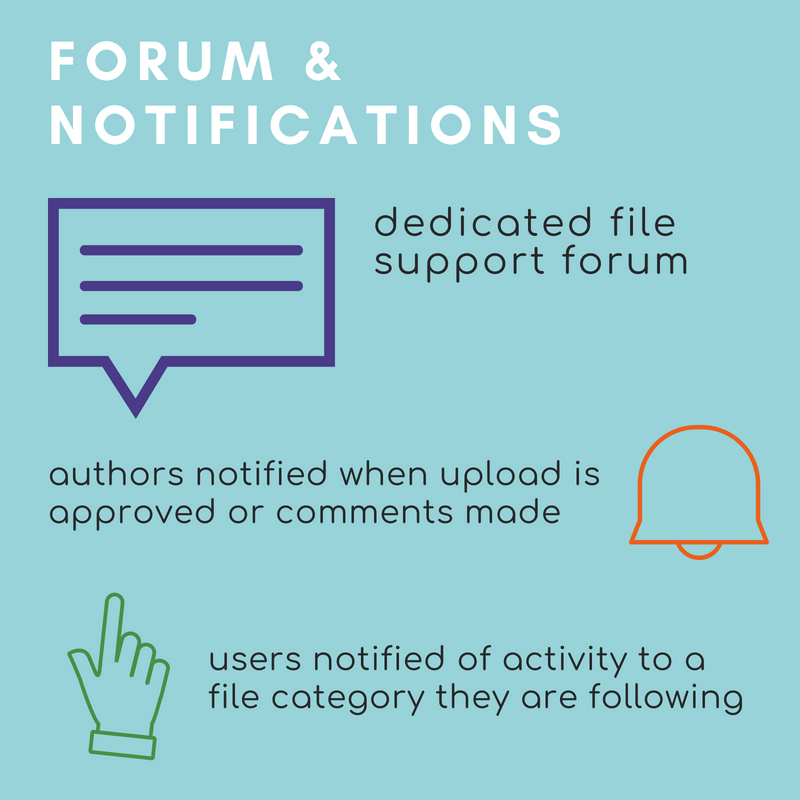 Notify file authors when uploads have been approved or a comment is posted to their file’s forum. 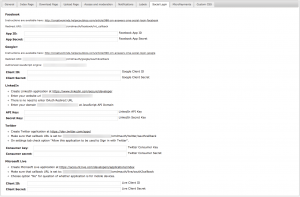 Send email notifications to users when a category they are following has new uploads. The CM File Download Manager plugin is integrated with other CreativeMinds plugins, so you can easily add other major features. 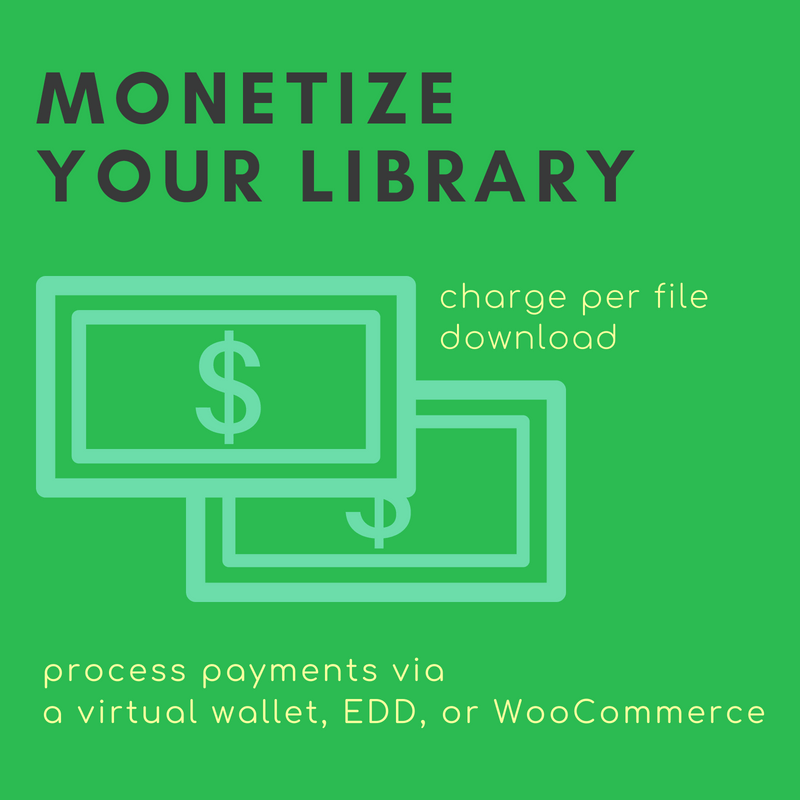 These include charging payments per download (via a virtual wallet with CM Micropayments Plugin or EDD payment platforms with the CM Payments Addon) and allowing anonymous users to upload files (via CM Anonymous Posting Addon). All frontend labels can be easily changed to any language so the user interface will speak your language. 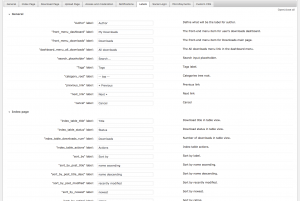 Additionally, we have PO/MO files for many languages covering all plugin frontend interaction. Supported languages include: Polish, German, French, Italian, Russian, Dutch, and Portuguese. We will be happy to assist with building other PO/MO files upon user request. Please see the Plugin User Guide to learn more about this plugin. 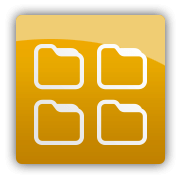 ZIP File Management – Compress all files or select specific files or file categories to download as a zip file. 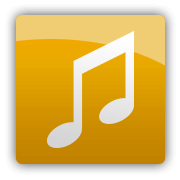 Audio Player – Embed an audio player for previewing audio and mp3 files prior to download. 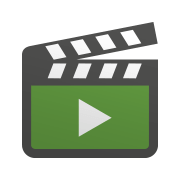 Video Player – Embeds a video player to preview video of mp4 and other video files prior to downloading. 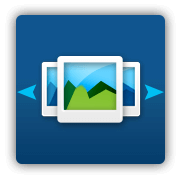 Image Gallery Slideshow – Display an image slideshow for each download. 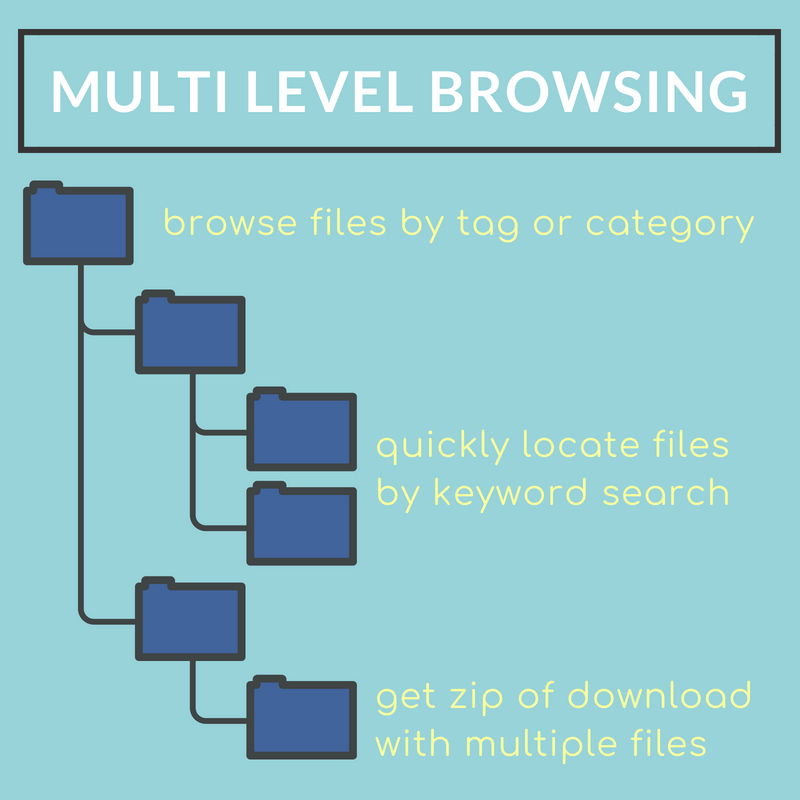 File Categories – Support for multiple level browsing on download categories. 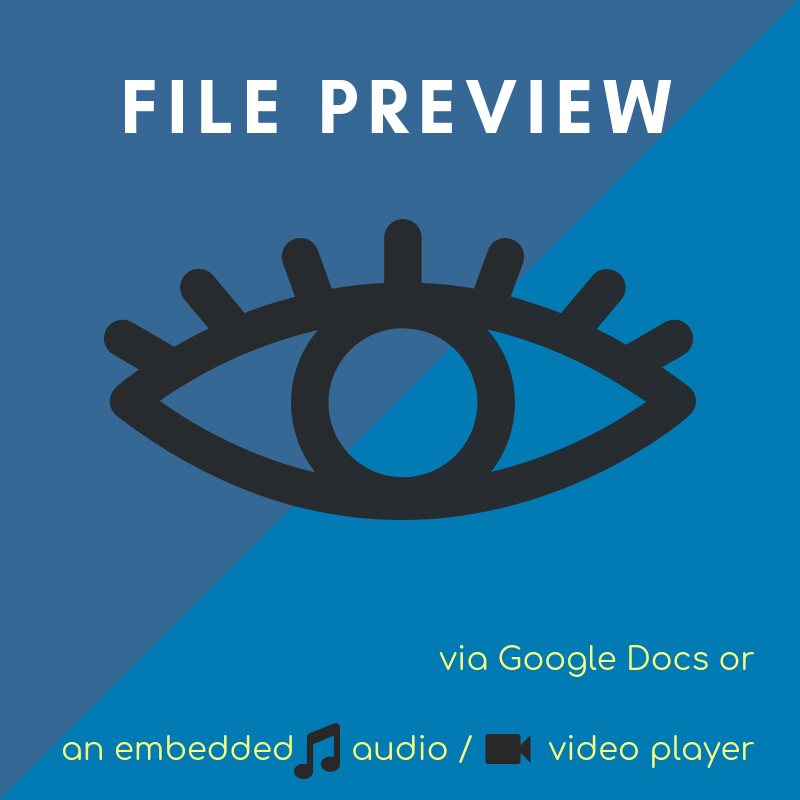 Instant Preview – Integrated with Google Docs, allowing easy file preview before download (supports all main document and spreadsheet file extensions). 1 – 1 File Access – Restrict access so users can only see their own files and files the admin shares with them. 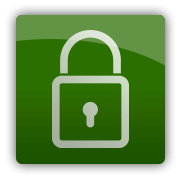 File Access Control – The admin can set access settings to grant permissions for individual users or user groups to view or upload files. 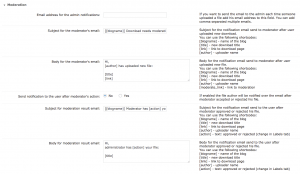 Email Notifications – Send custom email notifications to download authors when their file upload has been approved or support questions are posted. Notify users of file uploads to categories they follow. 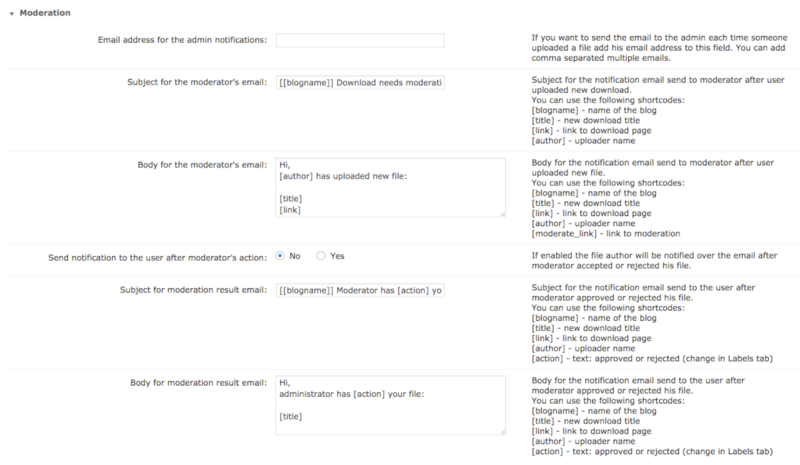 Notify the admin when uploads are pending approval. 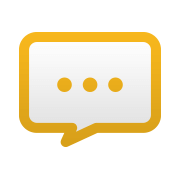 User Moderation – Moderate user posts and permissions on the support forum or choose to pre-approve posts and uploads by specific users. 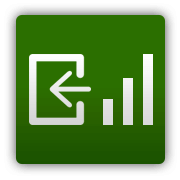 Download Log & Statistics – Generate a detailed report from the download log with file specific stats based on download date, user, and location. 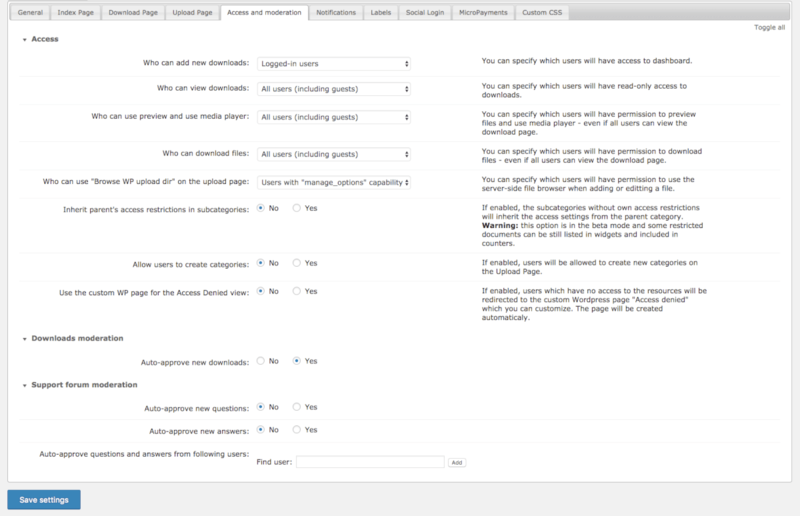 Download Zone Customization – Easily customize the look & feel of the digital downloads template page with your theme. 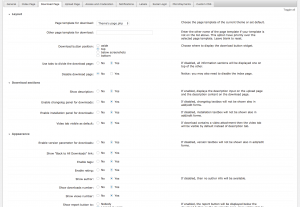 Download Index Page Views – Choose from 3 different templates to display the Digital Downloads Index page. 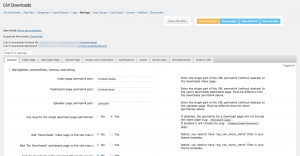 Download Page Templates – Customize the style of the CM WordPress Download Manager page template and adjust the plugin’s look and feel. 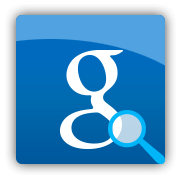 Search Downloads – Use the internal search engine on your site to quickly search downloads and find files of interest. 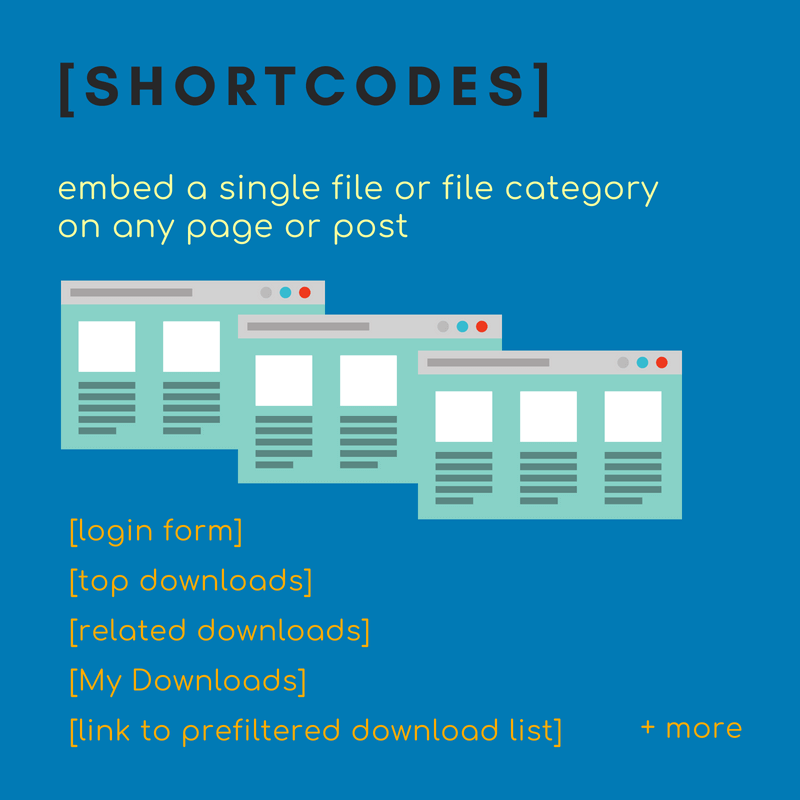 Download Manager Shortcodes – Embed a specific download or list of digital downloads on any page or post using a shortcode. 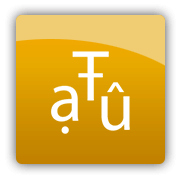 Localization – UTF-8 characters are supported, allowing text translation into multiple languages. 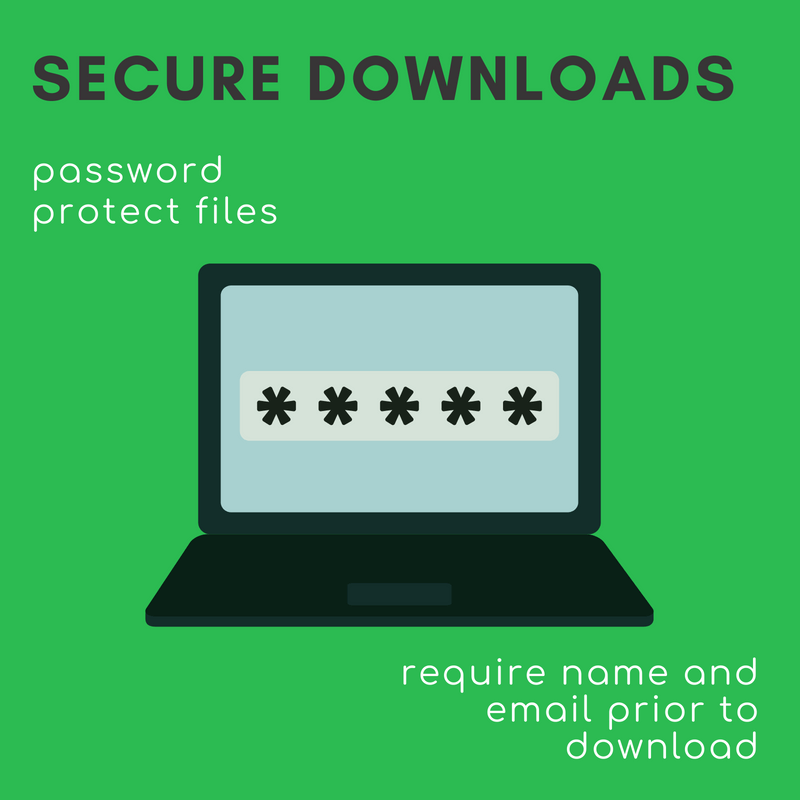 File Password Protection – Password protect file downloads you want to restrict. 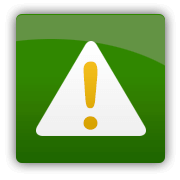 File Manager Disclaimer – Include a disclaimer requiring users to agree to your terms when visiting a download page for the first time. 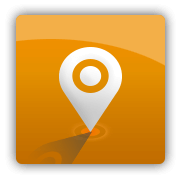 Geolocation – Track where your files are being downloaded via a free Geolocation API key. 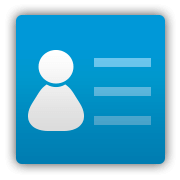 Social Login – Users can login to the file sharing directory with their social media accounts from Facebook, Twitter, LinkedIn or Google+. 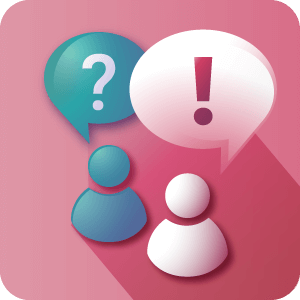 Support Forum – Includes a support forum for downloads that lets users post questions or support answers for each download. 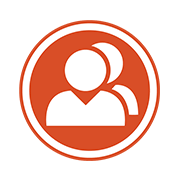 BuddyPress – Integrated with BuddyPress to display profile information and download stats according to a user’s BP profile. 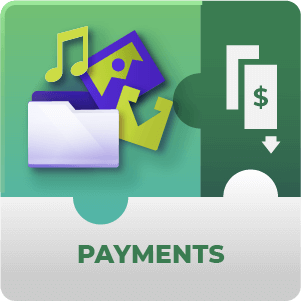 CM Micropayments Integration – Allow site visitors to earn a virtual currency for file uploads and require visitors to spend their virtual currency to download files. 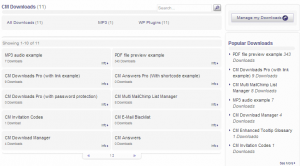 CM Answers Pro Integration – Add the enterprise message board to each download. 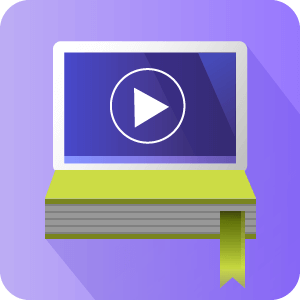 Watch the video clips below to see each File Download Manager Plugin feature in action, or try them out yourself on our demo site! 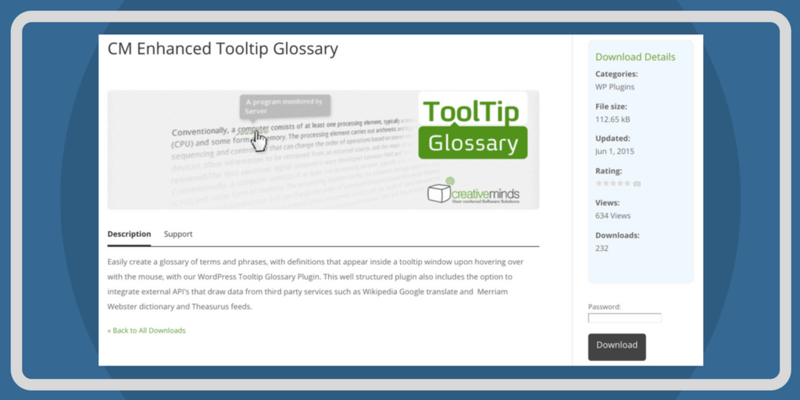 For more in-depth descriptions, visit our Video Tutorial Library or plugin User Guide. 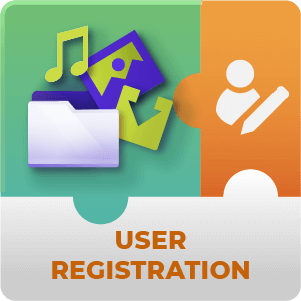 Adds a user registration form to support automatically assigning new registered users to CM Download user groups and applying access restriction to downloads. 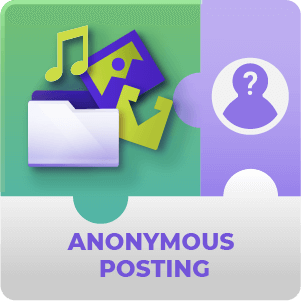 Allow users to (anonymously) uploads files to CM Download Manager Plugin without the need to login to your wordpress site. This plugin creates a restricted area which users and site managers can use to share and manage files. File downloads support user notifications and statistics. Admins can share files with groups of users and password protect specific files via the download manager. 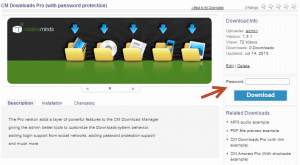 How do I upgrade CM Download Manager? To upgrade from the free version to the pro you need first to deactivate and delete the free version. 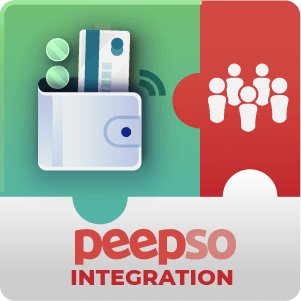 All terms that have been created with the free version will be automatically transferred to the pro. 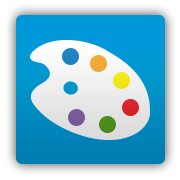 You can them download the pro edition from CreativeMinds customer dashboard and install it. Is it possible to localize the forum for languages that don't appear on the list? 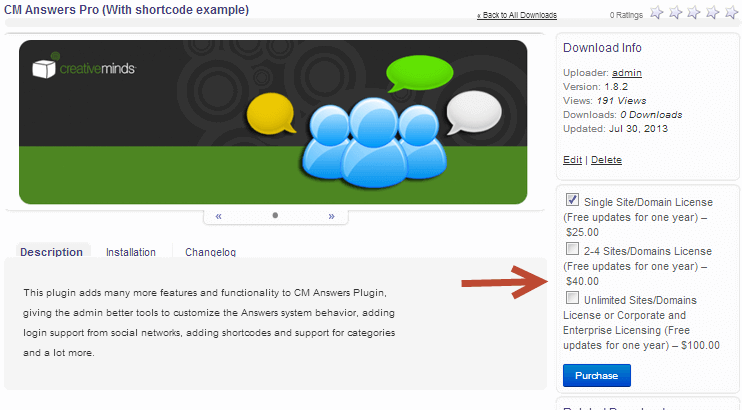 forum localization with CM Download Manager can easily be done using the /lang directory in the plugin. After creating these two files, copy them to the language directory. You are also welcome to send them to us so we can include them in the plugin pack. Is there a way that users can download files without logging in? Sure. 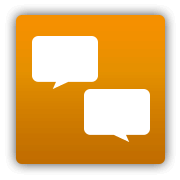 Only users who need to upload files or users who want to post a support question in the downloads dedicated forum need to log in. All other users can download files without logging in. 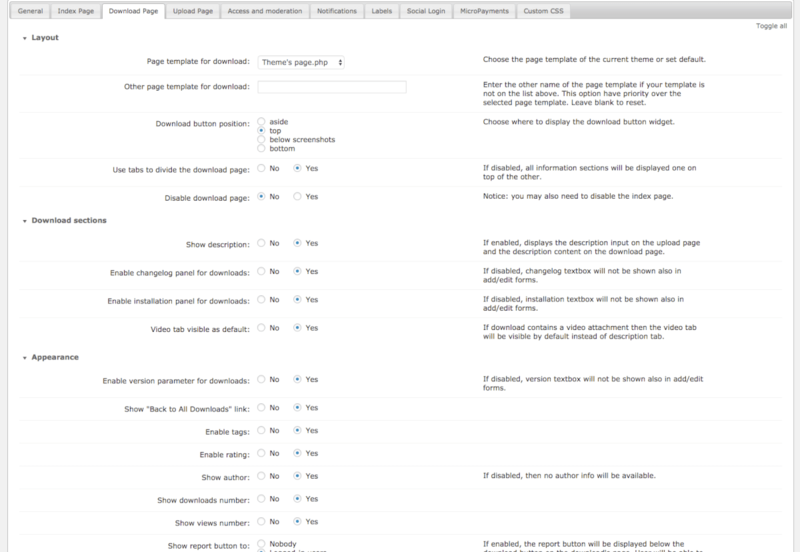 You can define access permission for each download or for all downloads in the plugin settings. Access permissions can limit which download is visible for which user. Can I add custom CSS to my downloads landing pages? Yes. 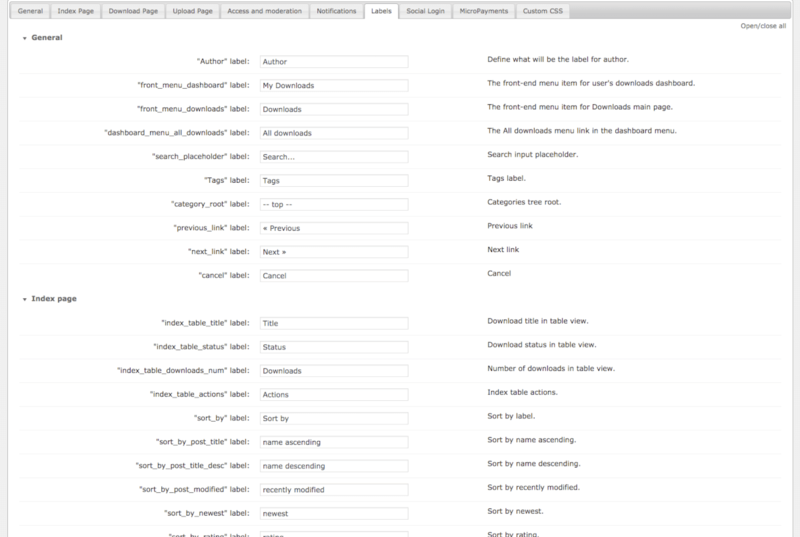 In the plugin setting you have a tab for custom css where downloads landing pages as well as the general downloads directory can be customized to suit your theme. 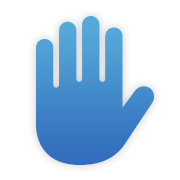 This will enable you to change css on the fly. You can also rewrite css in your theme css using the same classes and making sure it loads after the plugin css. The last option is to edit the plugin css located in /view/resources but this is not recommended since each time we update the plugin you will need to review your changes. 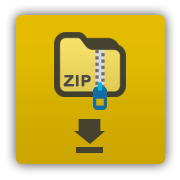 Is it possible to upload zip folders to the downloads directory? Absolutely! 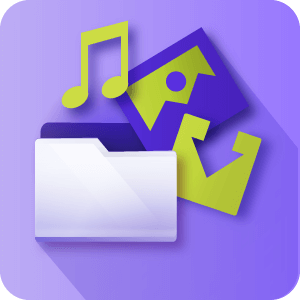 If you want to allow users to upload multiple files to your downloads directory, for example a bunch of software files or musical tracks, zip folders will provide the ultimate solution. They will save you and your users both time and storage space. 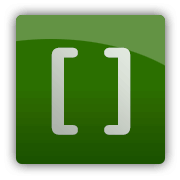 Zip folders can easily be created on your computer and then uploaded and downloaded either individually or in bulk. 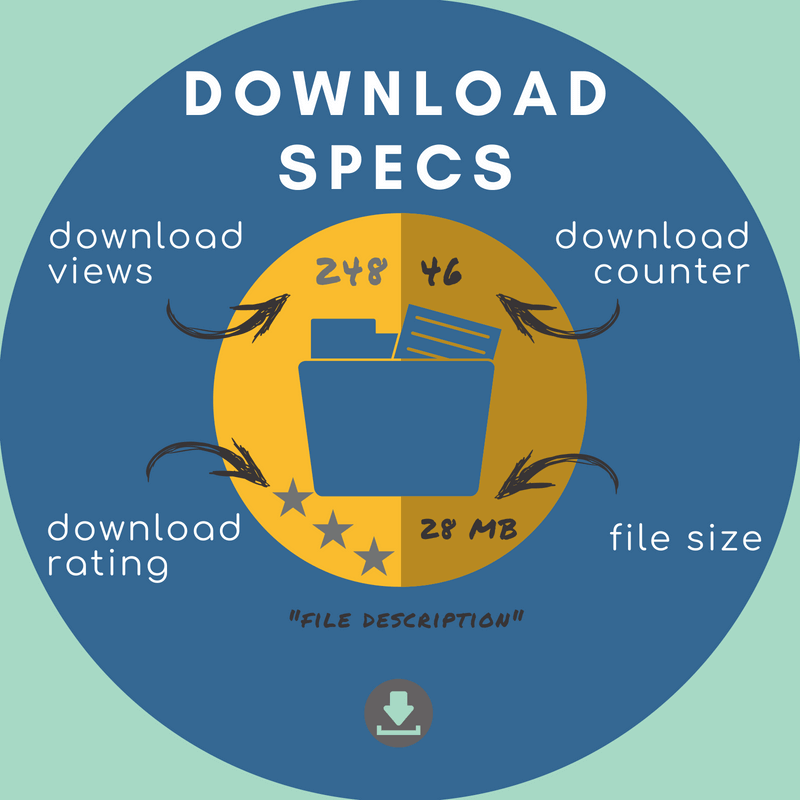 Which file extensions can users preview? 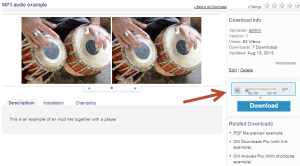 Audio and Video (using embedded players) – mp3, mp4, ogg, wav, wma, web, flv, rtmp. 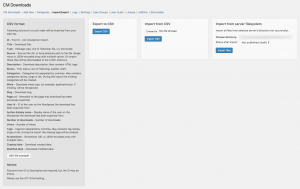 How does the BuddyPress integration work? 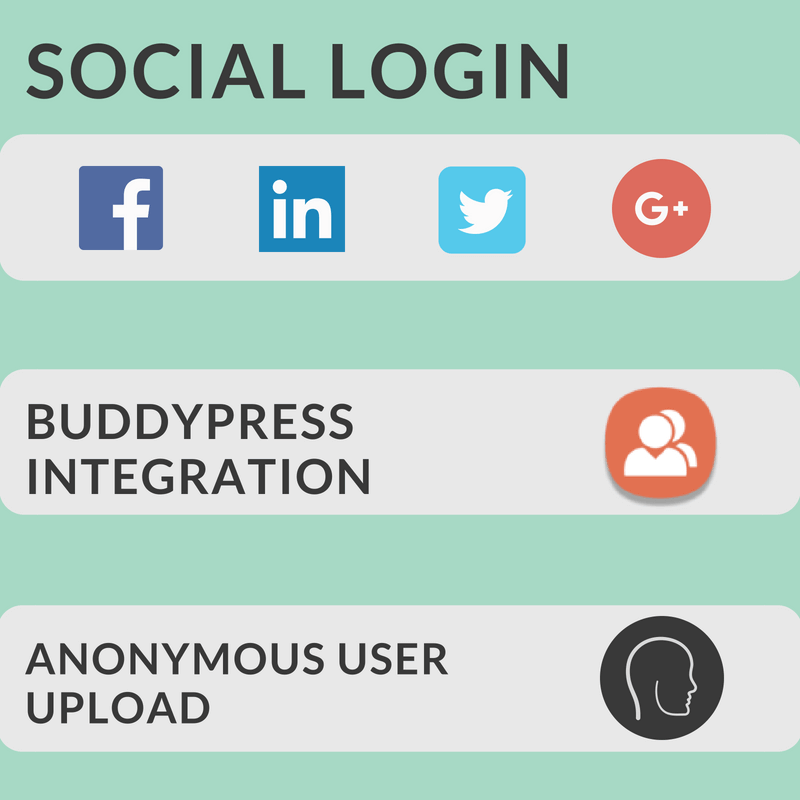 Performing the CM Downloads Manager and BuddyPress integration allows your users to quickly login to your file sharing directory using their BuddyPress profile. 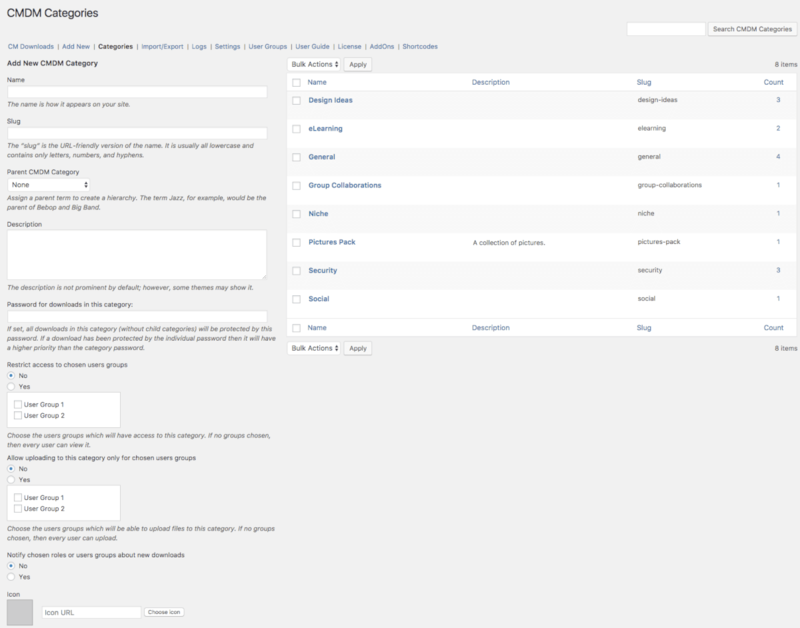 This is recommended for site that use the BuddyPress forum system and want to add a file sharing option. How do I restrict downloads access to specific user groups? 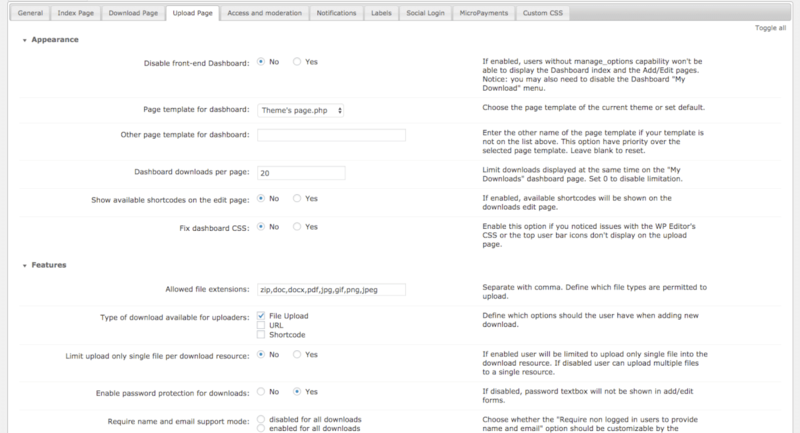 The first thing to do is to adjust the plugin to support logged in users only. 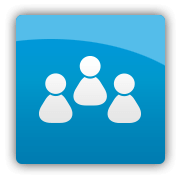 Then, under user groups, you can create different groups and specify which users belong in which group. 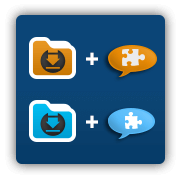 Next, when creating a new file for download, you can assign each file to a specific user group. Users in that group will be able to view and download the file, while all other users will be denied access. I'm very grateful for everything, very high quality relation with users. keep it up. I can’t say enough how rare it is and THANKFUL I am to be able to work DIRECTLY with the plug-in developers when issues arise! The plug-in interface isn’t an artful masterpiece, but the functionality is good and the support for issues is outstanding. Worth every cent! Really useful plugin. Plus, both technical support questions about my multisite licence were resolved quickly and in a friendly way. Nice work. the knowing and friendly creative minds team supply fast programming, professional work and best service ! I really can recommand creative minds to everyone who needs and searches reliable partner for wp and magento works. I purchased the Pro version and have it customized with some “Customized Hours” from Creative Mind (to have a tailor-made design that fit perfectly with my client’s request), and I’ve been delighted with the result!The website is now online (I prefer post a review when the website is finish to avoid getting a first, wrong impression; as it’s too often the case) and counts now 133 documents (and still growing).Both my client and I are very satisfied with the result: no glitch, fast loading, effective query,responsive design… The support team and the sell team happened to be very reactive and effective as well (and on time! ).Some may say that some functions are confusing (e.g. the menu, the interface) but I believe that each plugin has its own very way of working, and when you get to understand this one, it will just do all what you expect it to!I surely recommend this plugin for anyone who wish to have a Searchable Database, or an Online Library (you name it as you want); the balance price/quality is more than fair.PS: I am a web-designer, not a web-developer, so the simplicity and the effectiveness of a plugin is crucial for me (please, spare me the coding!). I have this plugin customized, but I believe the Pro version would work just as well out of the box. 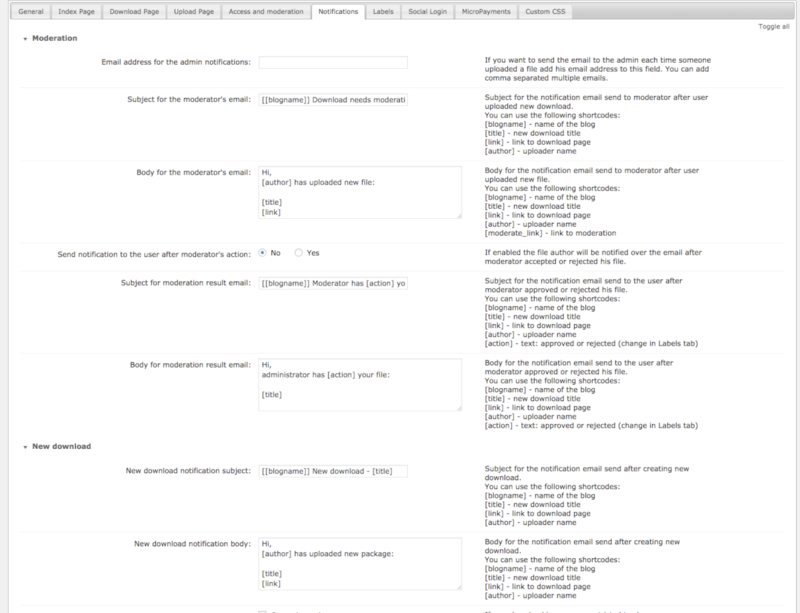 Tried several download management plugins, this one had all my required features and then some. Support was quick (above and beyond) to assist with install and enhancement request. I was really impressed how quickly the support team gave me a hand to fix stuff. I am a designer, so sometime my requests are very fussy. However the support team made all of my requests done so quickly. The end result looks amazing. 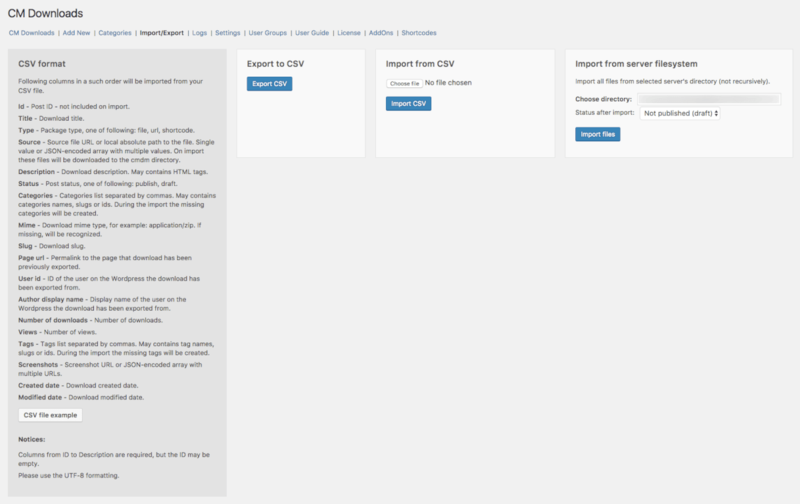 Not only visually, but the plugin’s functionality works so smooth and user friendly. I’m a very happy customer. If anyone looking for download plugin, I recommend CM download manager! I’ve purchased my fair share of plugins for WordPress over the years and have often come up against the brick-wall of plugin support – but not so with this group. Even after 11 months, this group is just as interested in helping me as they were day-one. This is certainly a pleasant surprise.So far, they have also been very helpful in listening to feedback and feature requests. I’ve been very pleased with their support. If my clients have need for any of their products, I wouldn’t hesitate to order again. Love the pro version of cmdownloads. Easy to use and good support. What a great plug in cmdownloads is and what fantastic support. 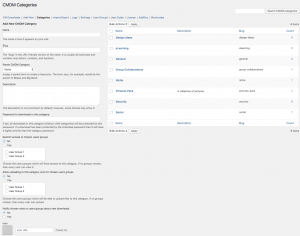 I needed to create an online document archive, viewable by the public but which members could upload to without logging into the WordPress backend – this plugin does all that and looks great. I have been running the pro version for the past six months and any issues or question I have had have been answered quickly by support and they have not hesitated to go into my admin area and sort out the problem.The plugin is easy to set up with lots of configurable options and widgets and shortcodes. This is a very good and useful plugin! I have used the Pro-version for a while and it is really good. I have also received very good support from the developers. 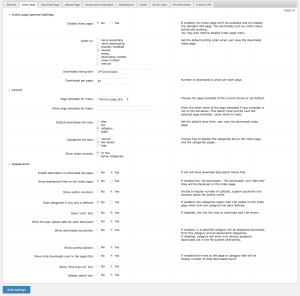 This was the perfect solution for what we needed in a file management plugin for WordPress. Not only is it easy for the web designer to setup but also easy enough that the end user/client can upload their own files after 30 minutes of training by me. What really was a pleasant surprise was how quickly the developer Creative Minds answered my questions and are open to suggestions for improvements to the plugin. To me that is worth the price of the plugin!I’m only using half of the features this plugin has so there is plenty of room to grow if the client wishes. I would (and have) highly recommend this plugin to anyone looking for a simple yet robust file management system for WordPress. 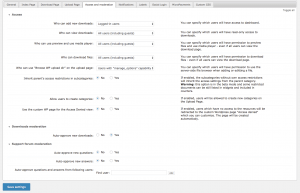 I have a WordPress website and needed a way to easily manage downloads and allow other people to access different documents and CM Download Manager does that. It is quick and easy to download and getting it set up and started didn’t take much time. I love that it gives me the downloads in a directory listing so it is easy to manage. I am able to see who downloads documents and how many times documents have been downloaded. CM Download Manager has helped my site become more organized and has made it easier for me to run a website. Upgraded to the pro edition for the shortcodes, formats and the BuddyPress integration.The customization is pretty cool as well as the file preview feature. Great experience so far. Very simple and efficient.I highly recommend it for anyone looking for a download manager plugin. I have had an amazing experience so far with CM Download Manager. I have a blog on WordPress and it was getting exhausting running it by myself. CM Download Manager allows me to have the ability to be able to have multiple users log in and they are able to access all of the different sets of documents that I have laid out to each one of them. It’s nice that I can set up individual files for each one and they are each able to access their own specific files.On my blog, I post a lot of files that users are downloading. This plugin has made the process that much easier. It’s so easy to use and it’s working great for me so far.CM Download Manager has kept me organized. The support team has been great in aiding me with any questions that I have. Great plugin that does what it’s supposed to! This is a very solid plugin, does what it states and it’s well supported. Who’d need more? Really Helps to Keep me Organized! I have had a WordPress site for a few months now, but what I was lacking was a good Download Manager plugin. My site was very unorganized as a result, and I knew I needed to do something to fix my issues. 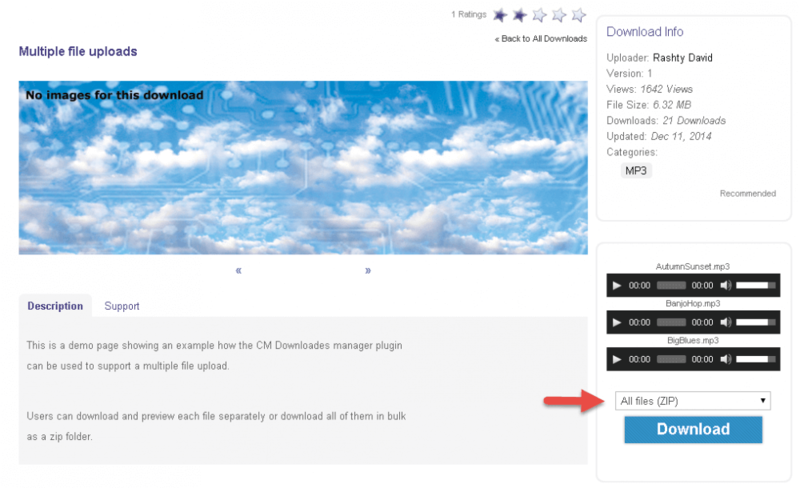 I came across the CM Downloads Manager, and really liked what it had to offer.Downloading and installing the plugin was extremely quick and stress free. Very easy to intergrate onto WordPress; you don’t have to be a computer tech to do it. I noticed quite a few things that I really liked right away; first of all, you have the ability to upload, manage, and track files in a directory listing format, allowing others to be able to easily use and comment on. You can specify which users have the ability to use these features as well, which is a huge plus. You also have the ability to preview music you want before downloading it – love this feature! You also have the ability to customize the look and feel of it, which I have already done.Since downloading the CM Downloads Manager and using it for awhile on my WordPress, I have to say that I’m extremely pleased. It really helps to keep everything in order, and It’s not buggy at all (unlike some other plugins I’ve tried). I would highly recommend this one! I manage a website using WordPress, and I needed an efficient way to upload files. 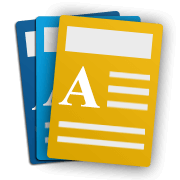 I wanted a plugin that would allow other website admins to upload documents, and to manage what users are able to download these files. In the past, I did not have an acceptable solution for this, and since I had control of all of the files to be uploaded, it became solely my job; the other admins had to ask me to upload files. I felt like I was doing everything to manage a website that I was already paying others to assist with.I currently have the free version of the CM Download Manager Plug In, and I am very happy with it. I am pleased that there is no limitation on downloads, since I have chosen to make most of my uploaded files public. I have the ability to see how many views each file is getting, as well as votes for each user download.The index where I manage my downloads has lots of useful features that allow me to sort my downloads based upon the particular stats I am looking for, such as by upload date, popularity of the download, and more. This helps me to evaluate my site’s success better.I am definitely happy with how this plugin has helped to increase my productivity and has changed the way upload files on my website. I am definitely considering purchasing the paid version; with all of the extra features, I’m certain that my website could benefit greatly. 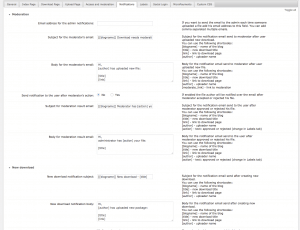 My WordPress website was driving me crazy. I am not a computer tech and had difficult time to manage my website. I was introduced to use CM Download Manager by my website builder. I have loved it since then. 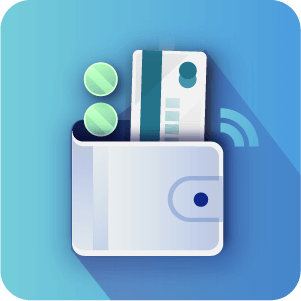 It has simple and user friendly interface, which allows multiple users to login and I am able to assign different accessibilities to each of them. Now I am no longer the only one doing the work. At the same time, it helps us work even closer together and more efficiency. I am also amazed by their customer support, whenever we have questions, they are there to help and answer. Cm Download Manager does help us running the website a lot. I recommend it highly. Download plugin that is reliable and easy to use! I have been using CM Download Manager for a couple of months now. I needed a plug in that would allow me to have multiple users, each with access to a different set of documents. CM Downloads allows me to do just that!Not only am I happy with the product, but the support is amazing. When ever I have a questions, or can’t figure something out, the support team gets back to me in a very timely fashion. They are also understanding and patient. I’m new to website building, and I’m sure I ask many silly questions. The support team has always treated me with respect, no matter how confused I am :).Over all, if your website will have users downloading files, this is the plugin you need. Looks great, easy to use user interface. Quick to load, and keeps you up to date on file downloads. Very happy, thanks CMPlugins! 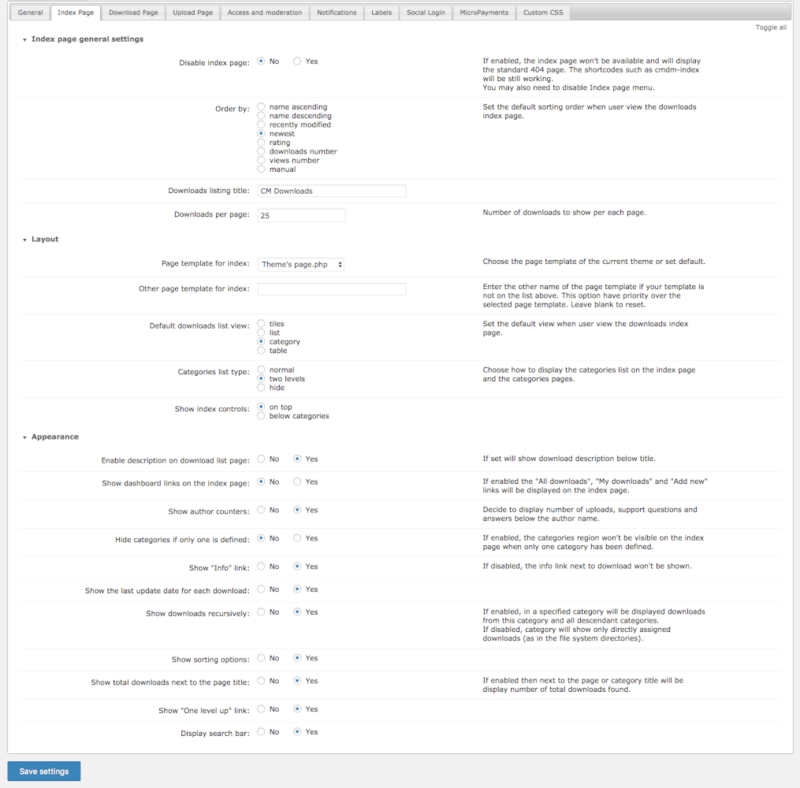 WP Explorer: "Download Manager Review by WP Explorer - I got my hands on CM Download Manager Pro and two things impressed me straight away: It’s intuitive and it’s compatible with the other CM plugins I’ve tested."